This Efficient and practical 2012 CRV Touring has been extremely well taken care of. The "Aspen White" exterior is in excellent condition and is paired with a black odor free leather interior! 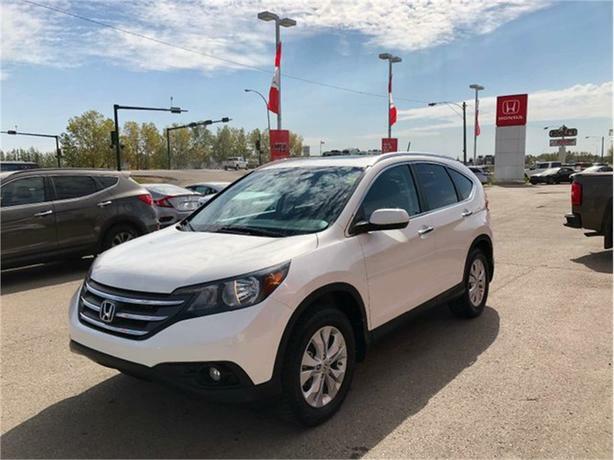 This CRV is the top model and its packed full of useful features to make you feel more at home while driving down the road! The trusted 2.4L VTEC engine is sure to give you plenty of power and great gas mileage too! This CRV has been regularly serviced and maintained at Western Honda. For your peace of mind, our certified technicians performed an extensive multi-point, comprehensive used vehicle inspection on this vehicle. At this time other than changing the oil and filter and new tires, nothing more was needed to ensure this quality AWD is in optimal driving condition and more than ready for its next proud owners! This CRV is full of useful and thoughtful features to ensure the best driving experience! Some of those features are; halogen headlights, a sunroof, an automatic-dimming rearview mirror, dual-zone automatic climate control and heated leather-trimmed seats. You'll appreciate the high-resolution touchscreen display with navigation, premium audio with available satellite radio, while an illuminated steering wheel with cruise, audio, phone and i-MID controls keeps power at your fingertips. Of course, with massive cargo space, a retractable cargo area cover, and 60/40 split rear seats, the CR-V can handle your family and everything they need for their many adventures! Our professional sales team is waiting for your call and would love to help you find your next vehicle. Email us at: sales@westernhonda.ca or give us a call at 306-693-5959. We Know You Will Enjoy Your Test Drive Towards Ownership!